EnzoSpa is inspired by the beauty of the American Southwest - Arizona, New Mexico, Utah and California - and the moisure absorbing succulents that thrive there. Each and every EnzoSpa product is derived from organic desert succulents selected for their resilience and natural healing effects. EnzoSpa's entire range is naturally based with powerfully effective plant and desert fruit extracts using high quality natural oils. Each range has been engineered to supplement, nourish, moisturise, and replenish imbalances in 3 easy steps, whatever your condition, whatever your lifesyle. 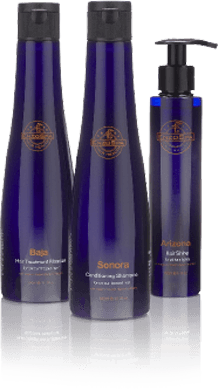 EnzoSpa is a luxurious collection of products for hair & scalp that doesn't require a lot of time and fuss in order to achieve fabulous results. Whether you live in the tropics or the Alps, close to the sear or in the desert, our ENZOHAIR hair and scalp health products are all varied to accommodate these differential factors. EnzoSpa has 4 unqiue ranges that cater to different hair types and conditions. Mix and match your products or shop from complete ranges. Take our self-analysis quiz to help us guide you to choosing the best products for your hair.